The 2007 CRD 11 / SBU XI 2007 Reunion is set for September 29, 2007, starting around 1000 on the Aircraft Museum, USS Hornet in Alameda, Ca, break around 1600, and continue at Pier 29 restaurant in Alameda with a No Host attitude adjustment 1800 and dinner at 1900. Guest speaker at the dinner will be Captain Evin Thompson, Commodore at Naval Special Warfare Group FOUR. The details and reservation form are posted HERE. To get your name and address added to the Reunion Roster for reservations and updates contact Robert Smith at (707) 935-9360 or nanapaah@yahoo.com. The SBU XI ball caps pictured below are available for sale at $20.00 mailed, or $18.00 at the reunion. We are also ordering T-shirts with the SBU XI logo on the front and one of MacAllister’s River Rats on the back. In September 2005 CRD 11 / SBU XI was resurrected with a reunion at the Red Lion Inn, Sacramento, CA. The hotel provided us with a large hospitality room where we were able to visit and enjoy the planned activities. There were tables of CRD 11 / SBU XI memorabilia brought by participants to share. SBU 122 sent Chief James Lindegaard and Petty Officer Gillepie with one of their unit boats to put on display. The Bacciocco brothers showed up in uniform from their drill at SBU 122. Although, someone told me they were older than dirt, they looked as solid as rocks. To see pictures and get updates of the reunion, check out the http://member.fortunecity.com/sbu11 web page Philip Evans has been updating for us. Thanks to Philip, we hope to have this web page available for all reunion updates and announcements. John Mulhall was Master of Ceremonies for the banquet. He did a great job; thank you John for your help. Master Chief Pat Battles from Naval Special Warfare Group THREE, Coronado, CA. Operations Department was our guest speaker at the Saturday evening banquet. In his presentation, Master Chief Battles honored the members SBU XI by recognizing that the skills and expertise developed at CRD 11 / SBU XI laid the foundation for today’s Special Warfare operations. He concluded by thanking those who retired from the unit for providing him and many others the opportunity to advance. We thank Master Chief Battles for taking the time out from his busy schedule to join us. Chief Lindegaard also spoke briefly about SBU 122’s activities regarding people deployed all over the world. The weather was great at Ben and Susan Reese’s BBQ on Sunday. Ben and Susan provided us with some awesome fried chicken, salads, finger food, cold drinks and a medley of desserts. There were about 35 in attendance and we all waddled home with full bellies and a memory of good times. Ben and Susan enjoyed having everyone and hope to be able to do it again some day. As for the business side of the 2005 reunion, the consensus of the members present for the 2007 reunion is to visit the Bellingham International Maritime Museum (BIMM) in Bellingham, Washington and combine it with a cruise to Alaska. We are considering the second week of September 2007 so mark your calendar and start saving your pennies. Cliff and Carol Murphy have graciously agreed to take on finding just the right cruise. We now have SBU XI ball caps for sale at $20.00 each which includes shipping; order form attached. 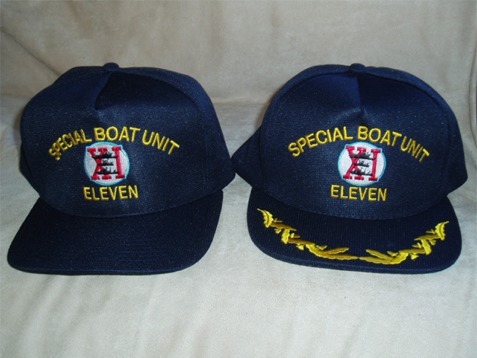 The ball caps are posted on the web. Bob is also working to get T-shirts designed with the river rat on the back and the SBU XI logo on the front. They will be posted on the web when ready. As for the financing, we paid all the bills and have seed money available for the next reunion. We want to thank Ben and Susan Reese, Debbie Gorman, Cliff and Carol Murphy, Melanie Taylor. We want to thank everyone for attending and making the reunion a success.